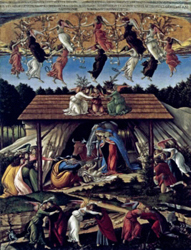 The style of this beautiful vision of maternal love, earthly harmony and heavenly ecstasy marks a radical departure from Botticelli’s most famous works, “Primavera” and “The Birth of Venus.” Odd, too, in the upper part of the Mystic Nativity, are the crowns with ribbons that have Latin inscriptions. Upon closer inspection Hatfield learned that it was a crown with inscriptions very similar to those he recalled from “The Mystic Nativity.” Meticulous research followed, and Hatfield confirmed that the crowns and inscriptions represented in Botticelli’s famous painting in fact closely echo elements found in the Savonarola wood engraving. He also investigated the unsettling Greek inscription at the top of the painting, which alludes to the imminent coming of the Apocalypse. “The discovery was so very exciting,” says Hatfield. Ever since Giorgio Vasari, writing in 1550, art historians have known that Botticelli had been strongly influenced by the puritanical friar Savonarola, who held Florence in his grip in the 1490s. Savonarola was repelled by the “vanities” in Florence; he encouraged Florentines to repent, give up their fancy clothes, extravagant lifestyle and pagan works of art. He also promoted Christian art, such as the woodcuts that illustrated his text. When Hatfield linked one of these to “The Mystic Nativity,” he found the “smoking gun” that linked Botticelli and Savonarola. SUF professor Jonathan Nelson, also interviewed for the documentary, is no stranger to the BBC audience, having already been featured in the “Private Life of a Masterpiece” episodes on “Primavera” and “The Last Supper.” He speculated that the inscription in Greek was initially completely hidden by the original frame, noting, “Even if you cover this strip, the painting’s proportions work and make more sense.” Nelson’s theory gives further weight to the idea that Botticelli had been swayed by Savonarola’s teachings but knew it was dangerous to publicly support them. How do you improve mammogram accuracy? Add noise.